Aboriginal Canadians have been allowed to vote in federal elections for 50 years now. But who’s voting? “Dumb? !” piped up one of my non-Aboriginal classmates from the back of the room. I politely reminded them both that for the most part, First Nations people had never really felt part of Canada in the first place, and that’s why something like Oka happened just a few years earlier. I said you can’t blame Aboriginal people for not voting if the process or the political parties never engaged them. Not much has changed since then, or since Aboriginal Canadians were first granted the right to vote 50 years ago. Prior to Prime Minister John Diefenbaker’s announcement in the spring of 1960, Aboriginal Canadians had to give up their treaty rights and renounce their status in order to cast a ballot in federal elections. The system that uprooted and manipulated the lives of Native people now granted them a voice in determining its future. But people haven’t exactly been flocking to on-reserve voting stations to take advantage of that. Turnout is still very low. 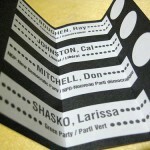 In the federal election of 2008, two-thirds of eligible voters showed up in Manitoba’s urban and largely affluent Winnipeg South Centre riding. 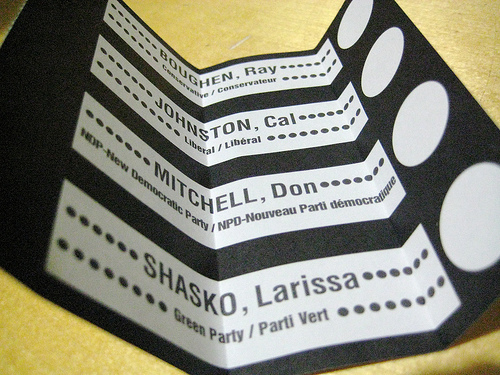 But in the northern, predominantly Aboriginal Churchill riding, only about one third of voters cast a ballot. A big reason for federal election apathy is no matter who’s running the big show, most people on-reserve only see two real political influences on their lives: their immediate Chief and Council, and Indian and Northern Affairs Canada. The various parties can campaign all they want on the rez, but whoever wins will just be the same old INAC to a lot of people. It won’t be until there’s a bigger presence of Natives in the House of Commons that attitudes will really start to change. Ultimately, it may take what people across the country have wanted for years – an actual “Indian” Minister of Indian Affairs. Seventeen years removed from Grade 10, I vote in every election. But I’ve been an engaged urban Anishinaabe for the past 12 years. Friends and relatives my age on the reserve still don’t really vote. They don’t relate to MP candidates, and election after election, they never see any change in their community. They won’t vote until these wannabe politicians speak for them, and not to them. « The Mike Harris Learning Library?? Another reason is with the word “enfranchisement.” The “vote” has positive connotations if you're European-Canadian or a more recent immigrant. “Enfranchisement” has the sting of having your treaty and status rights stripped from you – historically – for getting a university education, joining the Canadian armed forces, or voting in a municipal/provincial/federal election. Although those ways of becoming an instant ex-Indian have been removed from Canadian law, they have left a deep dank hole of suspicion in the collective psyche – and deservedly so. Then there is the refusal of neo-colonial regimes, like Canada, to recognize or reach accommodation with the Indigenous nations that were here before it, with working government systems of their own until the imposition (sometimes by armed force) of the Indian Act band council system. That left behind a lot of people who still view participation in the Canadian political system as bogus, undermining their own Indigenous governments struggle to be recognized, and disloyal to their aspirations of self-determination and freedom of choice.